Since Avatar there has been an overwhelming number of movies that have been post-converted into 3D starting with the film Clash of the Titans all the way to the recently released Thor. These post conversions have been met with some pretty mixed results. For example Clash of the Titans was quickly post-converted its film into 3D and the results were disastrous. The picture was darker and blurrier, everything appeared to be a cutout, and the overall look of the film was diminished. The next example I have is Alice in Wonderland 3D. After doing a bit of research on this film I discovered that the entire film was post-converted and none of it was filmed in 3D. This was very surprising because of how much both critics and film goers talked about how fantastic the movie looked in 3D. After reading up on Alice in Wonderland it lead me to the conclusion that it is possible for post-converted 3D films to look good. So after thinking it over I gave post-converted 3D another chance when I went and saw Thor in 3D. While Thor was well converted and actually looked pretty solid unlike Clash of the Titans; the 3D still did not really enhance the movie much at all. 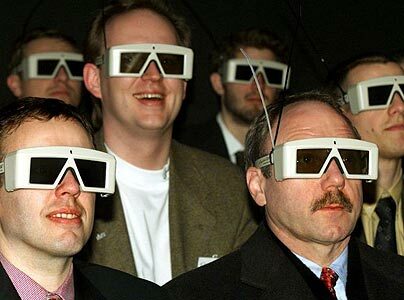 So now I have become a bit of a cynic by deciding not to see any post-converted 3D movies. The problem with making this decision is that this summer is loaded down with movies being put in 3D. Almost every major title this summer will be put into 3D including Pirates of the Caribbean:On Stranger Tides, Kung Fu Panda 2, Green Lantern, Cars 2, Transformers 3, (gulp) Harry Potter and the Deathly Hallows pt 2, and Captain America. Only 1 of these films has actually been filmed in 3D which is absolutely absurd. I have always defended 3D as a way to enhance movies by creating an immersive experience(as with Avatar and Tron Legacy), but the fact that there are so many movies being post-converted is a sign that 3D is again reverting to a gimmick much like it did in the 1980s. So what is the cause of the 3D explosion? Studio executives. After the success of Avatar studio executives from around the world saw that audiences were willing to lay down the extra money to see the more enhanced experience. After seeing this they all decided that its cheap and easy to convert a film into 3D so they could do that and easily make up for it with the extra $$ they would be drawing in from theaters charging extra for the 3D. It all comes down to money. I do not believe that all of this conversion business is being brought on by the film makers. If you look at other upcoming blockbuster movies like X-men First Class, Super 8, and Cowboys& Aliens it is clear that not all film makers are letting their films get butchered by studios. These films are directed by Matthew Vaughn, J.J. Abrams, and Jon Favereau. These are film makers that have a reputation in Hollywood and also have more power than the average director over his/her film. Notice that none of these guys chose to film or post-convert their movie to 3D. Another great example of a director refusing 3D to his movie is Christopher Nolan and the Dark Knight Rises(the third Batman movie). Nolan has came out and said that 3D would not fit his vision nor would it enhance the film(check here), and what executive is going to tell the man who directed one of the highest grossing films of all time no. Unfortunately most directors don’t have this authority over their film and because the executives have ultimate authority of what is in most movies they choose to go with 3D. Its looking less like a creative choice and more like a $$ choice which is sad and ironic. I say its ironic because the 3D camera was something that was very innovative and was created for the sole purpose of creativity by Cameron and Winston with their own time and money. 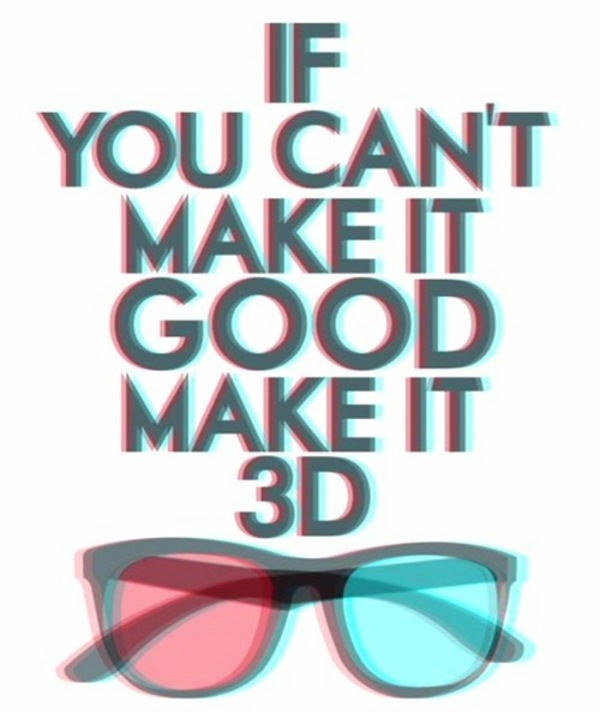 With studios pushing harder for 3D with no end of the trend in sight what can viewers who don’t like 3D do? Its simple. Stop seeing post-converted films and start seeing the movies that are filmed in 3D. I know this will require a little bit of research(5 minutes or less), but know what you’re getting into before you see it. Something to keep in mind is that executives really just want to make money; they want their company to succeed and if 3D stops being a cash cow I promise that less and less films will be in 3D. To send executives a message; do it with your wallets; they won’t fund something that won’t benefit the studios. The important thing to remember is that 3D can be an enjoyable experience that can enhance films and I would highly advise anyone to support movies that actually trying to do new and creative things with 3D. The problem is that the studios have seen something done creatively and they are trying to replicate with every blockbuster that hits this summer. So avoid post-converted films and movies that appear to be trying to cash in on the trend. Is 3D necessary? It has the potential to be, but due to execs trying to milk the cow it has become entirely unnecessary. Is 3D in movies a gimmick? It was never intended to be, but due to man’s perversion of all things good it has become one.